When cold weather hits, we work hard to ensure that major routes are safe by salting and brining before any snow or freezing rain starts, and plowing once snow falls. Our crews keep major routes safe by salting and brining them before any snow or freezing rain starts. Get real-time updates by following us on social media. Use this VanConnect form to report non-emergency snow and ice on streets and sidewalks in the city. It's easy to forget that winter driving is different. Shift into winter with preparation and driving tips from the Winter Driving Safety Alliance. We may get less snow than the rest of Canada but when it arrives, you need to be prepared. All property owners must clear snow and ice from sidewalks around their property by 10:00am every day. Unable to clear the snow? Ask a neighbour for help or request a Snow Angel. Failure to remove snow and ice may result in fines. 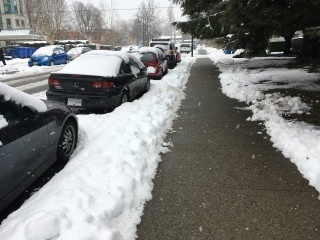 Learn the rules about snow removal in our Street and Traffic Bylaw (section 76). Make sure you have shovels and salt before it starts to snow. Double check your winter gear and ensure you have boots that are safe for walking in. If you drive through the winter, consider getting tires with the three-peaked mountain and snowflake symbol or the mud and snow symbol, with at least 3.5mm tread. The Province of BC requires these tires on provincial highways from October 1 to April 30. Learn more about winter tires. We plow major roads, bus routes, school routes, and emergency routes. When you move your car to a side street or garage, we can make sure snow along these routes is cleared. Check transit schedules at translink.ca for commuting alternatives. In darker, wet weather, visibility is limited and changing road conditions make it harder to see. Wear lights and reflective gear, and make eye contact with other road users. Whether you're walking, biking, rolling, or driving, being mindful about how you travel can help make sure everyone gets home safe. Learn more about our goal for zero traffic-related fatalities. Clear snow and ice from the full width of sidewalks that surround your property by 10:00am every day.